Thick and soft with a cosy brushed finish, Elle Wool Blend Zig Zag Slipper Socks are ideal as a relaxing accompaniment to an evening in. The home socks have a cushioned feel and attractive two-colour zig zag patterning on the ankles, along with a non-slip tread on the soles to keep you safe on polished floor surfaces. 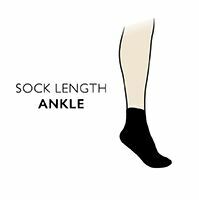 The socks are made with a mix of wool and other fibres for warmth and softness.